The Groves residence on South Lamar is modern, eclectic and in one word, cool. This is one of the busy South Austin neighborhood’s newest multi-family communities, and is close to a wide variety of nightlife, entertainment and restaurants. The unique spirit of the Groves’ location was a key factor as the Art + Artisans team worked to select artwork for the project. The goal for the Groves was to celebrate the trendy neighborhood’s signature style within the space, and make a connection with the surrounding community. Through Austin-centric music graphics, elements of topography, and the inspiration of the outdoors entering the indoors, the space encompasses a welcoming Austin funk and cool vibe. 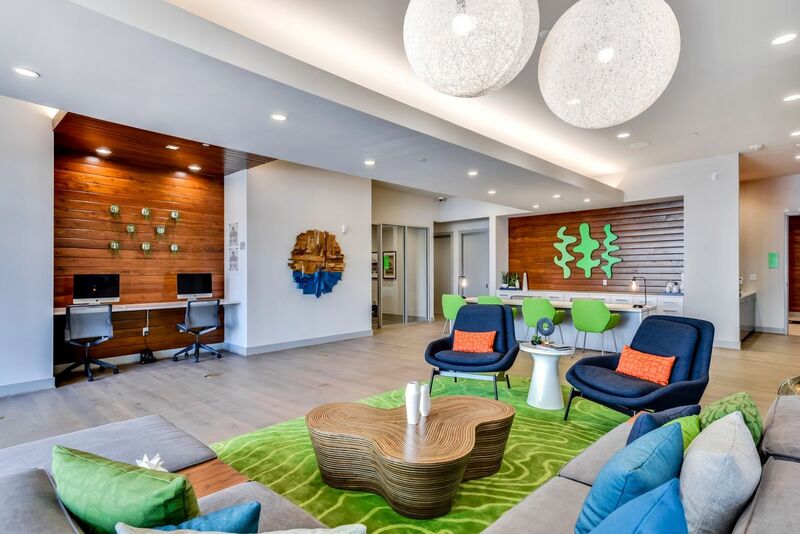 Bright and filled with organic light, the shared community spaces and offices feature beautiful natural wood as well as vivid orange furniture and lime green accents. The balance of these aesthetics creates a unique and visually stimulating blend, perfect for a quick-paced South Austin environment. You can further explore the Groves project and its incredible artwork, here.